In our 8/7 State of the Galaxy, we covered some of the rewards and intricacies of our next major release: Territory Battles. As we promised, we want to share some more information about this mode. Territory Battles is a new cooperative mode for guilds, found at a new table location in guild’s cantina room: Guild Events. Guild Events unlock at Player Level 65. The first thing players will be struck with is this new kind of Holotable, the Territory Battle map. 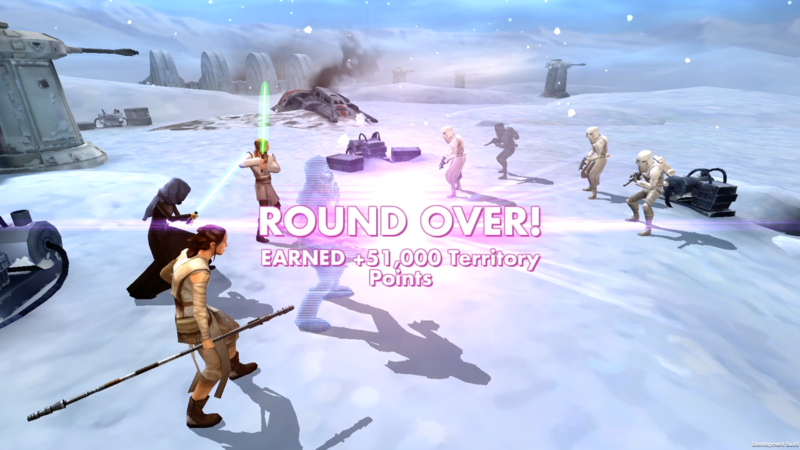 Territory Battles will launch on the Planet Hoth with an event called the Imperial Invasion. In this battle, Guilds must bring the strength of their entire collections to take over strategic landmarks and ward off the Imperial forces, with unique bonuses and mission opportunities for Rebel and Light Side forces. 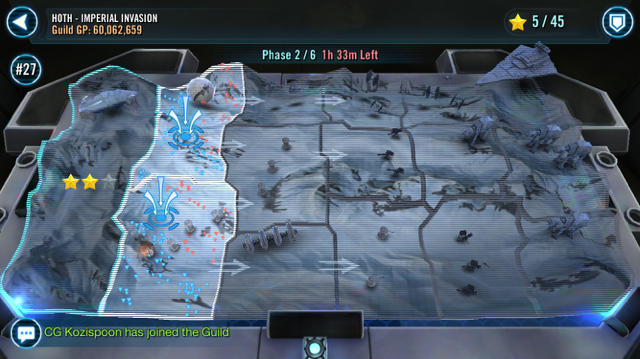 Territory Battles are a three day Guild event consisting of six phases that are each 12 hours long. After each phase, units that were used previously are reset to be used again. The first phase begins at 6AM local time, based on the time zone of the founding Guild Leader. Guild Members work together to conquer Territories on a map by participating in a variety of missions on that Territory, including Deployment, Combat Missions, Special Missions, and Platoon Missions. Each of these are described in detail below. In most of these missions, players earn Territory Points. However, players must be strategic about where they choose to put their troops to maximize their Territory Point contribution. Coordination across the Guild is also important to maximize the Guild’s overall success, as measured by the total Stars earned. Guilds can earn up to three Stars per Territory through Territory Point acquisition, but must earn at least one Star to unlock new Territories in the next phase. The arrows on the map show how to unlock each Territory. After the first phase, Guilds can decide to focus all their troops on one Territory or spread out across the map. However, if at least one Star is not achieved in a single Territory, then the guild must redo that Territory again in the next phase. If at least one Star is achieved in all Territories in the phase, then all Territories in the next phase will unlocked. Territory Battles is the first feature where every unit collected and every upgrade provides value, including units seldom used in combat. This is made possible by a new stat called Galactic Power, which is the sum of the power of all of a player’s characters and ships. Galactic Power increases with every single modification made to the unit, including its level, ability levels, mods, star rating, and gear. Read more about Galactic Power here. During Deployment, players send part or all of their collection to fight on a Territory earning Territory Points based on the Galactic Power of those units. Once units have been deployed to a Territory they can participate in any mission on that Territory, but can not be deployed to any other Territory during that phase. When the next phase starts, units are available to be deployed once again. Participating in Combat and Platoon Missions will automatically deploy those units, so players must make those decisions strategically! In Combat missions, players are faced with six waves of enemies. Each additional wave cleared earns increasing amounts of Territory Points,. If a player is unable to beat all six waves, all Territory Points earned for completed waves will contribute to the Guild’s total. Combat Missions have special requirements for which units to use. Most commonly they require Light Side Characters or Rebel Characters, but sometimes even a specific unit. These missions also provide stat bonuses for some units that are important to Hoth and Rebels. In Platoon Missions, all Guild Members work together to complete Platoons. Each Platoon requires 15 specific Characters with a minimum star level (which changes depending on the phase) There are six Platoons in each Platoon Mission. Platoon Mission progress is shared across the whole guild, and Players are limited in how many slots they can fill individually, so Guilds must coordinate to fill every slot accordingly! 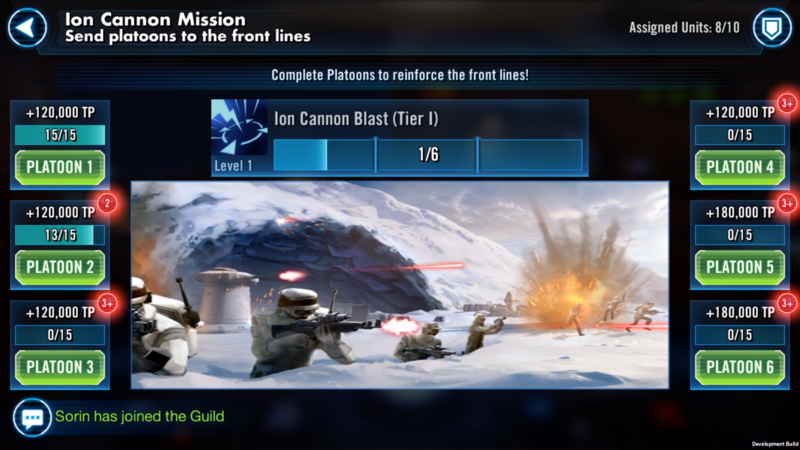 In addition to earning Territory Points for each completed Platoon, Guilds can unlock powerful abilities from strategic landmarks like the Ion Cannon. Every two Platoons that are completed upgrade the magnitude of that Platoon Mission’s ability, up to a maximum of three tiers. So, completing all six Platoons would unlock the maximum power of the Ion Cannon. Once unlocked, these abilities will be available to the entire guild in future Combat Missions – so pay attention to which zones are affected by these strategic landmarks, and especially players who are auto-battlers! Other Platoons Missions unlock abilities in future Combat Missions that weaken the enemies or debilitate them entirely to give the Guild the upper hand! In Special Missions, instead of earning Territory Points, players earn unique rewards for the entire Guild. For example, in one Special Mission all Guild Members earn one Rebel Officer Leia Organa shard for every Guild member that completes it. Special Missions are more challenging, have stricter unit requirements, and don’t show up as often as Combat Missions, but have great rewards. The Guild earns rewards based on the number of stars earned, but they also earn a new currency: Guild Event Tokens. These tokens can be spent on exclusive high-value rewards including Gear 11, Gear 12, and shards for Rebel Officer Leia Organa, Captain Han, and Hermit Yoda. Every Guild Member that participates earns the same rewards. For friendly competition, there is a stats screen which ranks Guild members based on their contribution to the Territory Battle. These ranks do not affect prizes awarded. Guilds can also compete with each other for placement on two leaderboards:  Guild Galactic Power, which is the sum of the Galactic Power of all guild members, and  Highest Star count earned on the Territory Battle. The Star count Leaderboard resets every month, and the top three guilds from the previous month will earn the bragging rights of having their name show up in the Cantina. We look forward to seeing how players use cooperation and strategy to master the Territory Battlefield! See you on the Holotables very soon! You didn't get the update last night? Its awesome, you should check your app store for an update. Nightsisters are required at level 85 g11 so start farming! I have yet to see a territory battle that requires a troll squad. Good thing too cause I have only farmed/geared nightsisters and tuskens so I can complete this awesome new mode each day. Seems like we are all in a stand still at the moment. Didnt you see the developer announcement???? We need C.U.P and mob enforcer AND ugnaught at 7 stars minimum g10. Yes! I knew that getting CUP to 6 stars was a good idea! hmmm. Guess you missed zChewie. Catch up!! It will take more than one attempt as they are not rewards @MadMalgusReturns there are avaliable in the territory battles shop. So we know we're getting Hoth Han and Hoth Leia shards as rewards for territory battles. Will we be able to 7* them first time around or will it take multiple recurring Hoth Territory battles to do it? You get special bonuses if you use geo spy. Start Farming! Latest info from dev: territory battles will be as deep and as full of content as Star Wars battlefront when it has been released. Prepare yourself for epic battles fool ! I'm starting to think Territory Battles is a late April Fool's joke with the lack of information they are providing. OMG everyone is so funny. I've never heard any of these jokes used before on this site!! Dont you need a 7* g11 GK? 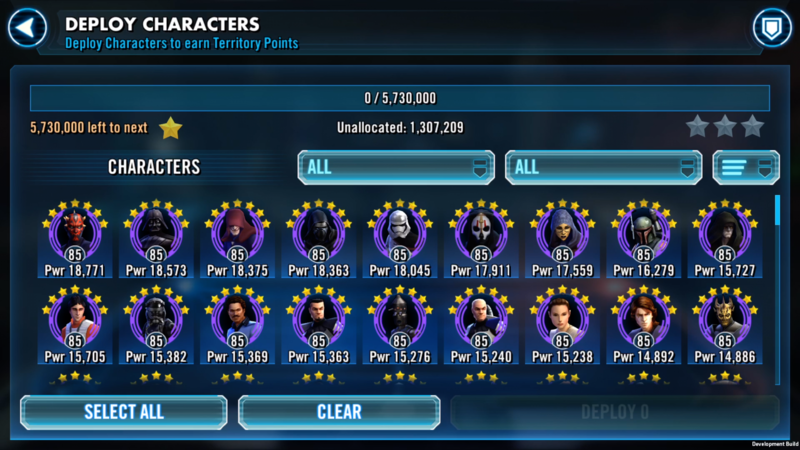 nah we need a 7* Shore, Krennic, Thrawn, DN and Baze, and they'll give you a level 1 g1 CUP to protect, once it's dead you lose! It's August. If they said Territory Wars will be released this month, would we believe it anyway?